Medela is a leading name in breast-pump products and are constantly looking for ways to support new and expectant mothers in their journey to breastfeeding. They currently have an application to help mothers track their feeding after giving birth, but they saw an opportunity to help mothers prepare prenatally too. In order to understand the needs of new or expecting moms in the context of the hospital setting, we talked to expecting mothers, nurses, lactation consultants and hospital administrators. During the sessions we gained an understanding around the clinicians’ current processes as well as the individual motivations of various users. Taking the insights into account, we created a prototype and ran feedback sessions to evaluate the experience of the solution within the context and processes of potential users. We began to identify areas where we could both empower and excite moms about breastfeeding, as well as enable better clinician and mom engagement around the topic. I sketched solutions, turning them into prototypes that we tested with our users. The following selection of wireframes are a result of two rounds of interviews and design reviews. Moms were looking for resources that helped them understand what to expect during breastfeeding. Clinicians had similar desires, as the more educated moms were before birth, the more relaxed they tended to be when making breastfeeding decisions after. Medela had plenty of educational materials but they were buried on their exisiting website. We designed space for content with both text and video, bringing these educational pieces to the forefront of the app. It was important that the content had some level of personalization because the needs of a new mom and a mom with other children varied broadly. 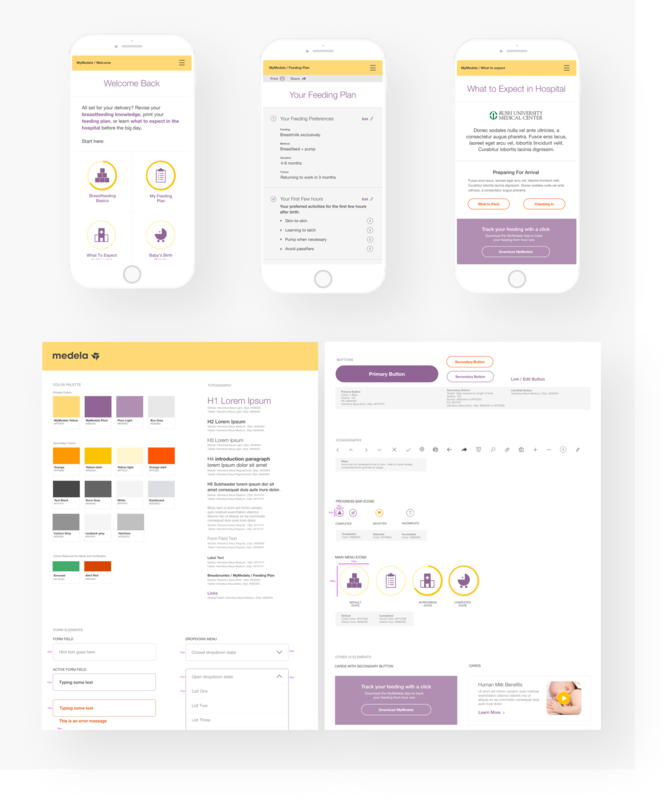 We designed the on-boarding questions to allow the system to know wether a new mom or a mom with other children were signing in. This way, we could cater the content to them. Facilitating communications between moms & clinicians. The main purpose of this tool is to empower and excite moms about breastfeeding, giving them the knowledge to make informed choices and initiate important conversations. Moms are often overwhelmed by the hospital experience so the ability to offload the need for decision-making in the hospital and having a place for them to access resources makes it easier for clinicians to focus on care, not paperwork. The designs allow moms to choose their preferences and share them with the clinician, highlighting both long term goals as well as her preferences just after giving birth. For a clinician, by understanding the wishes of their patients and having more insight into the context of her individual situation, they can make more informed decisions on what care and support is needed. Having more insight into the the mom’s preferences also gives them the opportunity to prepare the necessary equipment or resources. Hospitals often don’t have existing relationships with the moms themselves. Hospitals need ways to build a relationship with the moms and help them understand hospital processes and resources. Hospitals have the ability to personalize the patient experience from the welcome screen. They can include information about events, classes and a patient’s care circle to help engage the patient and increase satisfaction. 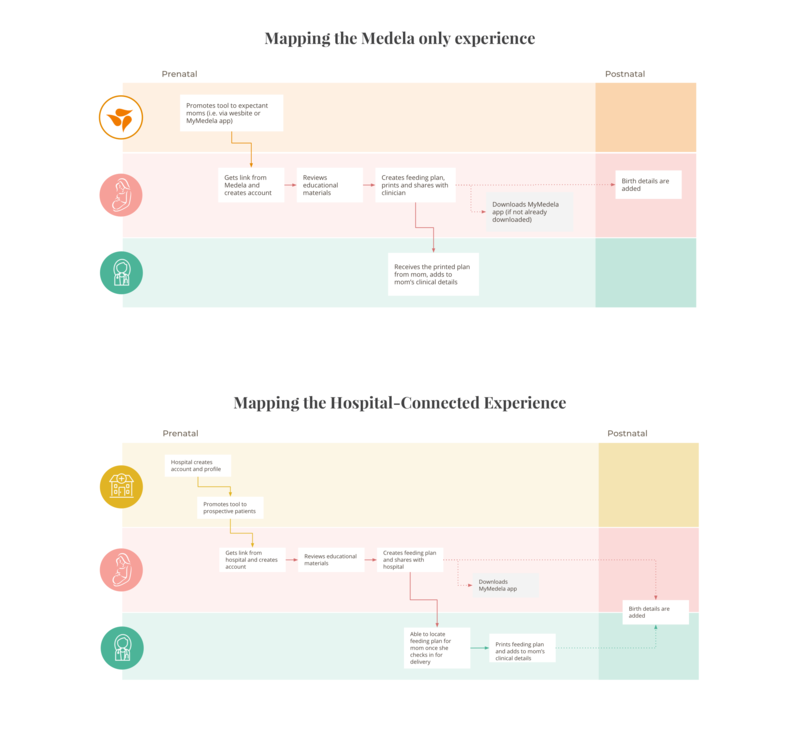 In the future, the goal is to create an aggregate view into the data collected from the moms and staff to provide more specific insights and ultimately provide a more consistent and informed patient experience. With the existing My Medela application already in the market, there was a visual style that was already defined. I did a heuristic analysis of what existed already, and began to make updates and recommendations to make the application more accessible and user friendly. I extended the visual language to cover the new components in the application, designing core screens and a detailed UI Kit for the development team.